You don’t need to own your own home or be an expert electrician to enjoy the benefits of a smart thermostat this summer: Quirky and appliance giant GE have teamed up to introduce the Aros Smart Window Air Conditioner, the first smartphone-controlled window AC unit designed to keep electric bills under control. Once installed, the 8,000 BTU in-window Aros works similarly to an AC unit tied to a Nest or Honeywell Wi-Fi Smart Thermostat. Once you complete the setup, you can control settings on the window unit using the free WINK smartphone app. As you adjust temperature higher or lower on sweltering summer days, Aros learns about you and your preferences to build an automatic schedule. While the remote functionality and learning features are great, what I like about the Aros is its “Smart Budget” feature. Using local weather reports, past usage data, and current electricity prices, Aros can reliably predict how much you’ll spend each month on cooling. You can even set a cooling budget to receive warning notifications when you’re approaching your limit. 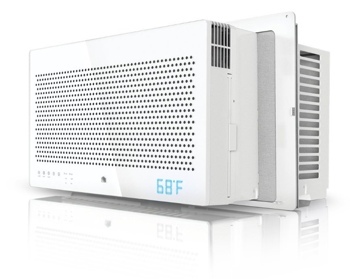 The Quirky + GE Aros Smart Window Air Conditioner retails for $300 and will ship in early May. You’ll be able to find the device at retailers like Home Depot, Walmart, Target and online at Amazon.com. For more connected home solutions like the Aros, check out our 2014 roundup of affordable smart home tech.